Today starts our letter C week of activities. We have a new batch of sight words, a book by Eric Carle, letter C craft, sensory activity, and science activity for you to enjoy with your kid’s–plenty of fun stuff to play and learn! So I had to share…I don’t push Ms. Tiger (age 3.5) into writing at all because it takes time for fine motor skills to develop and I don’t want to frustrate her into trying something that she isn’t ready for. However, the other day while we where playing with our sight words she asked if she could write letters. Look what she did, I am so proud! Yes the letters are all over the place, but that doesn’t matter. What’s important is that she tried, that I praised her, and she was proud! (I purposefully didn’t put writing lines on the cards because I think lines are too restrictive at such a young age). She continued to write letters and basically anything she wrote I cheered. Make a cute and fluffy C shaped cloud. 1. Draw the letter C on the paper plate and then cut it out. You could let your kiddo cut theirs out. I cut out Mr. Tickles (age. 1.5). 2. Glue cotton balls on the letter C. I used a lid to pour some glue into, then they dipped their cotton balls in the glue and stuck it to their plate. Dipping is easier then squeezing a glue bottle. As you can see, Mr. Tickles paid attention long enough to glue 5 cotton balls on his letter C before vacating the craft table. That’s why one of our goals for Tot School is expanding attention span, lol. 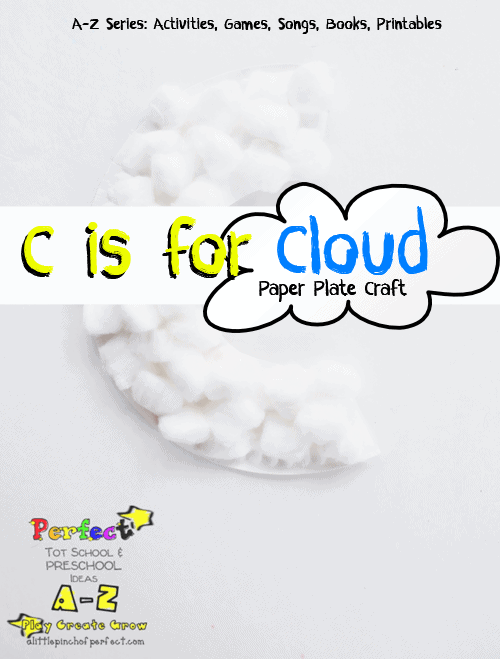 Let kiddos explore different textures while creating their very own cloud. You can use all edible supplies to make this activity completely safe for tot school (list of supplies coming up). 1. Place all supplies out and let kiddos explore. Before my kiddos made their clouds I had them touch each supply one at a time and decide how to describe what it felt like (sticky, squishy, sticky…) After that, the kids where free to explore. Originally I had all edible supplies on their tray (except for the cotton balls that I figured wouldn’t do damage and probably wouldn’t be ingested), but as the activity was going I decided to add shaving cream. This was a monumental decision because up until now, all our toddler activities have been taste safe when it came to sensory play. Whipped cream could be used in place of shaving cream. I just didn’t have any at the time. Trying a taste of his cloud before the shaving cream was added. We wrote the letter C in shaving cream once. Ms. Tiger (age 3.5) was more into playing then practicing letters so I didn’t push her into doing it more. The kids LOVED building their own cloud! A fun activity to help kids visualize why rain falls from clouds. We previously did a Why Does it Rain Cloud Science Activity that I think the kids understood more because the water coming out of the clouds looked like rain drops as it fell through the air instead of leaking down into water. The following activity is really fun, but I think an elementary aged kid would understand it more. They loved using their eye droppers to squirt blue water into the white shaving cream so I still consider it a successful Cloud inspired activity. 1. Fill a large bowl with water. We used my trifle bowl because of it’s flatter sides like a cylinder. 2. Spray shaving cream on top. 3. Fill a bowl with water and add food coloring. 4. Let kids squirt water into the shaving cream and watch the blue “rain” drops fall out of the bottom into the clear water. After awhile the water was all blue, but the kids didn’t seem to care. They where busy squirting water into the bowl. Have a wonderful cloudy day! We hope you have been inspired. We have more A-Z activities ready to share with you. If you haven’t already, don’t forget to join our followers so you can continue to play, create, and grow with us! Love the cloud activities Katie! Especially "build a cloud". What a great idea! I started following this blog with my 3 year old nephew and we have a lot of fun. Oh wow! What great activities for cloud lessons. Thanks Jill for stopping by and the sweet comment! This looks like such a fantastic idea for preschoolers. Thanks for this resource. I especially like the science experience of making it "rain". Thanks for this post. These activities/printables are great!!!! Thank you for linking your stuff up to the SHINE blog hop! I love these ideas! And so will my little guy once he gets old enough. I'll be pinning this for later use! Thank you for sharing! Hi Lara, thanks for the visit and the pin! Thank you so much for linking up to The Sunday Showcase last week. I really love your cloud activity!